Caption slip reads: "Photographer: Olmo. Date: 1958-11-25. Reporter: Denton. Assignment: FBI Feature. Special instructions: Negs. to Irwin Baker. 47: Entrance to FBI Headquarters. 49/50: Agents meeting. 51/52: Reception Desk. 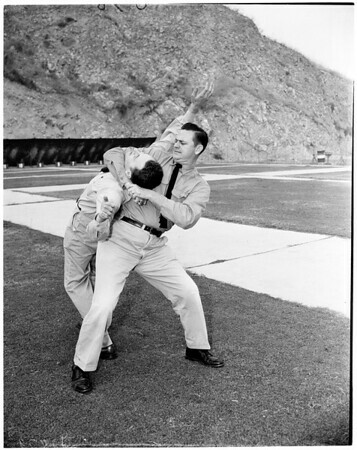 53 thru 71: Agents training in revolver and Machine gun firing, in disarming suspects and Judo tactics. Give all negs. on this series to Irwin Baker".